When Paul Krugman held the floor at the RAND Corporation in Santa Monica, he became Zócalo’s first guest to require a strictly policed door. He was also Zócalo’s first guest capable of discussing what it feels like to win a Nobel Prize. 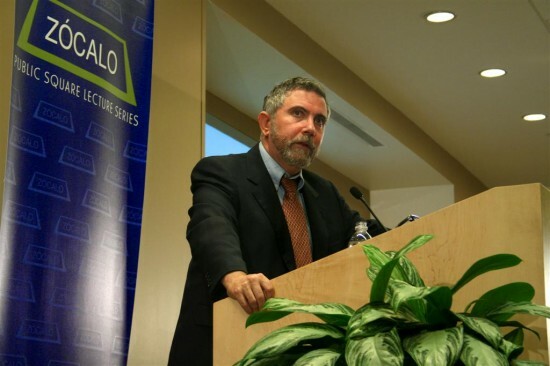 “Nothing exercises me too much in the last couple weeks” since his win, Krugman said. This year’s economics winner – also a New York Times columnist and professor at Princeton University’s Woodrow Wilson School of Public and International Relations – spoke before a capacity crowd at a pivotal time: weeks after the first domino fell in what became a major financial crisis, and just 10 days before the historic presidential election. Building on his knowledge of previous financial crises and his years of being an “economics ambulance chaser,” he explained why the markets collapsed and what might be necessary to repair them. The housing bubble – and the packaging of high-rated but ultimately insecure mortgage securities – triggered a bank collapse, Krugman noted, that was something like a 21st century version of what happened in the 1930s, only the banks that are dropping aren’t the marble-pillared main street kind. Krugman said the popped bubble means a loss of $7 trillion of homeowner value, about $1 trillion of which was held by financial institutions – “that’s what turned this into a screaming crisis. It means the financial sector suddenly doesn’t have capital.” He also predicted an eventual rate of unemployment as high as 10%, with still higher rates of underemployment and of workers simply dropping out of the job market. And while Krugman maintained that much of the crisis might have been predicted – placing most of his blame on “the invisible hand” but a good portion on former Federal Reserve Chairman Alan Greenspan – he also noted that some indicators are simply stumping economists. “Every time you think we have this under control, we’ve reached a bottom, another floor collapses under you,” he said. Still, Krugman had some remedies: more temporarily nationalized financial institutions and “a new WPA,” and the need for a shift away from conservative economic policy. “Barack Obama is living every Democrat’s dream – running against Herbert Hoover all over again,” he joked. With John McCain’s comments on the ultimate strength of the economy, and with Republicans struggling to discuss economic rescue without contradicting their decades of free market mantras, Krugman suggested, the race is Obama’s to lose.